One of my clients learned a tough lesson. They bought tile for their new home they were building. In order to save money (which is understandable) they bought unsealed tile and used an inferior sealer from a big box store. 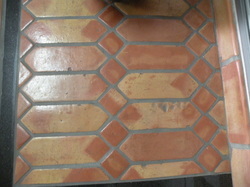 After a few years and multiple resealing efforts, they laid new tile but used my oil based sealer. You can read more about their tough lesson in our blog and watch the video to see their painful lesson.